Here's a weird thing. 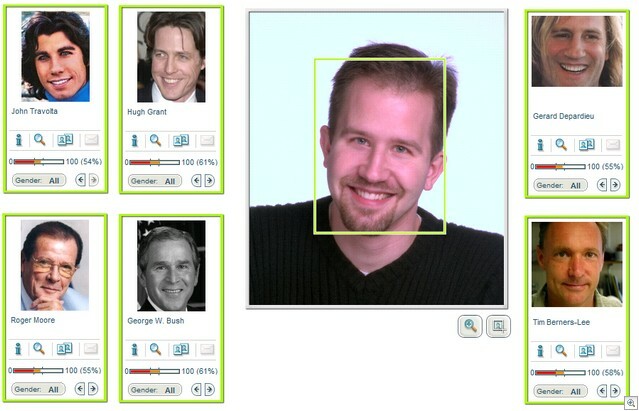 A site called MyHeritage wants to use Face Recognition Technology to connect folks with their relatives. As a demo, if you sign up on their site you can get a Celebrity Match as well. It's a fun technology demo, but I wonder how true a representation of their technology it is. I hope this isn't what we're using to stop terrorism. Here's some results...some more disturbing than others. I wonder how Riya's face recognition would do. Note the "confidence" levels in the pictures below. Maybe this means I'll finally meet Tim Berners-Lee. Side note, I was not surprised however to have Nicholas Cage popup at 66% for me since I've had one or two people indicate there was a rough (emphasis on rough) resemblence. Oh well, it was good for a laugh. The problem with face recognition software is the subdermal layer of fat on peoples faces, this can vary substantially from winter to summer for alot of people! Which overall changes the facial structure characteristics, they say they measure the distance betweent the nose, eyes, mouth, etc. Well as the skin gets rounded out or fuller, the depth of the layer would cause the computer to have an inconsistent data result you would think wouldnt you? I mean unless its able to detect depth and take that into account for its distance measurements how can it ever be 100% accurate? not exactly correct with the brandon lee crow photo! This has the makings of a good meme. Everybody post your lookalikes! You do have some similarities with Mr. Bush, I see. But his brain is nowhere near yours, meaning, you're much smarter! You know, the irony is by being so BAD at face recognition, they've created a viral meme that is spreading their name around. And as we've seen with James Frey, even bad publicity is good publicity. You were totally awesome in Green Card. I did this a few days ago, and got Anthony Hopkins as the closest match, which is not totally outlandish. The next closest was Charleton Heston, which is preposterous. Then a couple of places further down, just to bring me down a notch I guess, was some female European politician. My previous employer build a system that's being used in a large shopping mall, and at a soccer stadium. The latter can handle 60.000 people. During the entire event, everyone walks past hidden cameras and are automatically matched against a database. When you're in the database, you're not a nice person, and an alarm goes off. From that moment on, people behind monitors can watch your every move. This has been tested at busy nights with a few people who were test objects, and it worked extremely well.